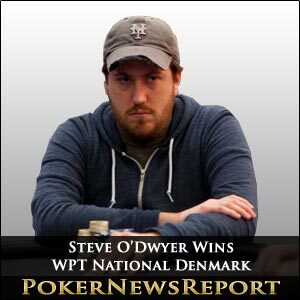 American professional poker player Steve O’Dwyer led from the front on the final day of the World Poker Tour (WPT) National Denmark to pick up DKK893,960 for winning the main event at the Casino Munkebjerg Vejle. It’s been a profitable few weeks, and months, for the Las Vegas-based player – who has taken to the road in Europe following the events of Black Friday last April 15 – after he pocketed $51,265 for finishing seventh in the DKK 35,000 buy-in No-Limit Hold’em main event of the European Poker Tour (EPT) Copenhagen to take his live tournament winnings to almost $2.5 million. O’Dwyer – who now has six titles to his name – is in doubt that he is on a fortunate streak, saying: “It’s been a lucky two weeks for me. Any time I play a big pot, no matter if I’m ahead or behind, it doesn’t seem like I ever lose”. In Vejle, O’Dwyer saw off 288 other starters in the €1,650 (about $2,179) buy-in main event that offered a prize pool of approximately $572,220 as he ultimately outlasted five Danish opponents – eliminating all of them – at the six-handed final table after four days’ play in southern Denmark. Martin Tønnesen took the runner-up spot for DKK 490,140, while places three to six were filled by Claus Uhrskov (third for DKK 339,960), Jan V Sorensen (fourth for DKK 225,030), Justin Lund (fifth for DKK 175,710) and Kenneth Laursen (sixth for DKK 138,720). Day 3 ended when O’Dwyer eliminated another Dane, Thomas Windtbjerg, as the final table bubble boy when the American overcame the short stack. Windtbjerg shoved all-in with K♣ 10♥ after O’Dwyer had raised with Q♦ 10♣. The Dane was well ahead and looked sure to double-up – and maybe secure a place at what could have been an all-Danish final table – only for a queen to arrive on the turn to give O’Dwyer the knockout. O’Dwyer started Day 4 as a huge chip leader on 2,636,000 with Tønnesen his closest challenger on 1,524,000, while the short stack was Uhrskov on 272,000. Having knocked out the other four Danes at the final table, O’Dwyer then entered his heads-up battle against Tønnesen with a 4 to 1 chip lead over his opponent. All that changed, however, as the home favourite fought back to hold a better-than 3 to 1 chip advantage, before two hands gave the American the crown. Tønnesen’s chip stack was demolished when he made a brave, but ultimately failed, bluff on a board of Q♦ J♠ 3♥ 5♥ J♥ when holding just A♥ 8♠ to be faced by the heart flush of O’Dwyer, whose hole cards were K♥ 10♥. The American was now in control and soon finished off the job when Tønnesen called all-in with A-9 but failed to beat the pocket tens of O’Dwyer. Certainly, the American has enjoyed an incredible seven months, having kicked off his successful run with victory in the $5,000 buy-in No-Limit Hold’em event at last July’s Bellagio Cup for $259,452. He then went on to win the $1,500 buy-in No-Limit Hold’em Pro-Am event the following month at the first Epic Poker League (EPL) tournament in Las Vegas for $43,810, took fifth place at the €10,000 buy-in No-Limit Hold’em Single Reload event at the PokerStars European Poker Tour (EPT) Barcelona for $67,568, before adding $726,790 for his runner-up spot in the £5,000 buy-in No-Limit Hold’em main event of the EPT/UK & Ireland Poker Tour (UKIPT) London early in October. O’Dwyer also made several other final tables between last summer and now, with his second place for $128,063 at the €3,000 buy-in No-Limit Hold’em main event of December’s WPT Venice his next massive cash. It really is incredible that every cash from that first one back in July last year to this latest in Denmark has resulted in a top 10 finish. That’s 13, if you are counting, for a $1,527,899 total. Nice work, Steve. The latest WPT event starts in San Jose’s Bay 101 Shooting Star today for five days’ play and includes a $10,000 buy-in main event, before the tour then heads back to Europe for the WPT Vienna, which takes place at the Montesino from April 10 to 15 and offers a €3,500 buy-in main event.